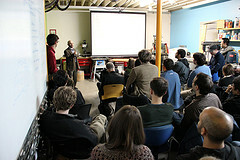 QS Boston Meetup #5 was held on Wednesday on the topic “The Science of Sleep,” a subject that comes up here regularly. The event was major success and, to my mind, demonstrated powerfully the potential of the self-experimentation movement and the exceptional people making it happen. Here is a brief recap of the evening, with my comments on what was discussed. A big thanks to Zeo for their generous support of the meeting, QS Boston leader Michael Nagle, and sprout for hosting the event. Michael put the theme into action uniquely by arranging for a free 30-day trial of Zeo sleep sensors to any members who were interested in experimenting with it and willing to give a short presentation about their results. 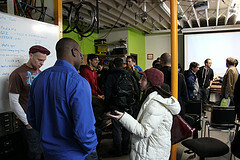 Over a dozen people participated, and the talks were a treat that stimulated lots of discussion. I thought this was an excellent use of the impressive members of this community, as the talks demonstrated. Zeo research scientist Steve Fabregas kicked off the meetup by explaining the complex mechanisms of sleep, and the challenges of creating a consumer tool that balances invasiveness, fidelity, and ease of use. He talked about Zeo’s initial focus (managing Sleep inertia by waking you up strategically), which – in prime startup fashion – developed into the final product. Steve also gave a rundown of the device’s performance, including the neural network-based algorithm that infers sleep states from the noisy raw data, something he said that even humans have trouble with. There were lots of questions afterward, including about their API and variations in data based on age and gender. All in all, a great talk. Adriel studied the impact on weather and his sleep (via the Zeo’s calculated ZQ) by recording things like temperature, dew point, and air pressure. He concluded that there’s a possible connection between sleep and changes in those measures, but he said he needs more time and data. Audience questions were about measuring inside vs. outside conditions, sunrise and sunset times, and cloudiness. Susan tested the effect of colored lights (green and purple) on sleep. Her conclusion was that there was no impact. As a surprise, though, she made a discovery about a the side-effects of a particular medication: none! This is a fine example of what I call the serendipity of experimentation. Eric tried a novel application of the Zeo: Testing it during the day. His surprise: The device mistakenly thought he was asleep a good portion of his day. He got chuckles reflecting on Matrix-like metaphysical implications, such as “Am I really awake?” and “Am I a bizarre case?” His results kicked off a useful discussion about the Zeo’s algorithms and the difficulty of inferring state. Essentially, the device’s programming is trained on a particular set of individuals’ data, and is designed to be used at night. Fortunately, the consensus was that Eric is not abnormal. Jacqueline finished up the participatory talks with her experiment to test whether she can sleep anywhere. Her baseline was two weeks sleeping in her bed, followed by couch then floor sleep. Her conclusion was that her sleep venue didn’t seem to matter. One reason I liked Jacqueline’s experiment is that, like many experiments, surprises are so rich and satisfying. Think bread mould. She said more data was needed, along with more controls. Sadly, she wondered whether her expensive mattress was worth it. Look for it on eBay. Finally, Matt highlighted the importance of self-experimentation. The point was that large trials result in learning what works for groups of people, but the ultimate test is what works for us individually. (He called this “individualizing medicine.”) This struck a chord in me, because the enormous potential of personal experimenting is exactly what’s so exciting about the work we’re all doing here. All in all, a great meetup.